Happy March, as it storms in as a lion and hopefully fades out like a lamb. No matter who I talk to, everyone agrees that it’s been a heck of a winter. There’s been dramatic weather changes, with temperatures rising or falling 30 degrees in a day’s time. Snow has been falling where it’s never been before, there's been powerful, pounding rain and gusting wind to boot. Mother Nature is pulling out all the stops, and all we can do is go with it, be prepared, and accept that things always change. Rather than getting worked up, annoyed or inconvenienced, be patient. I was reminded of the power of patience recently. It was the second week of February, and we were having family over for dinner. I thought it might be a good idea to take the holiday decorations out of the planters and retire them for the year. I put on my work gloves and went to pull the greens out. Nothing budged. I took a more solid stance, grabbed with two hands and pulled again. Nothing. I put my right foot on the planter to give me some leverage, and yanked again. Still nothing. I had the “bright” idea that the greens might be frozen in the dirt, so I got some boiling water and poured it into the planters, smugly thinking I had outsmarted the dirt. I grabbed with two hands, and other than getting some mud on my hands from the now wet dirt, still could not make any headway, except for beating up the planters a bit. As they say in martial arts, I “tapped out,” recognizing that this was not going to happen and I let it go. The following week, I had the thought to try again, bracing myself for another battle. Two hands, strong stance, I pulled and the greens gently released from the planter, luckily not toppling me over in the process. I was amazed by the difference just one week made, and I kept thinking about this as a bigger life lesson than just some greens in a planter. When life doesn’t go my way, I work harder, as if my sheer will and intention will force it to bend to my will. Every once in a while it does, but in reality, it is when I surrender, be patient and bide my time that it works out; oftentimes far better than I could have anticipated or planned. This is such an important life lesson, and it has applications in all aspects of our lives – including our health and well-being. So often, we set new goals for ourselves only to be easily defeated, as we don’t get the results we wanted based on our preconceived timeline. Sometimes, it takes our bodies longer to adjust to a new regime. If we can be patient and accept each day as a building block to better health and well-being, we will achieve our goals. And in the process, we'll have learned how to embrace the bodies we have and love them. In that spirit, I welcome the third month of the year with patience and acceptance—of my body, my life circumstances and yes, even my planters. On Groundhog Day last month, Punxsutawney Phil saw his shadow and thus predicted that we would experience six more weeks of winter. This silly tradition isn’t always accurate, but has been true so far, keeping things cold and dormant. But no matter how long the winds of winter blow, sooner or later, the warming sun of spring will emerge. With March already here, it is only a matter of time before the warm days that are few and far between become the norm. The transition to spring brings many changes in nature, the most notable of course always being the growth of new life, from the sprouting buds appearing on the trees and the blossoming of flowers to the bright green grass starting to push its way skyward from the ground. While the beauty of this season and the warmth it brings are always welcome, not every part of spring is as exciting. 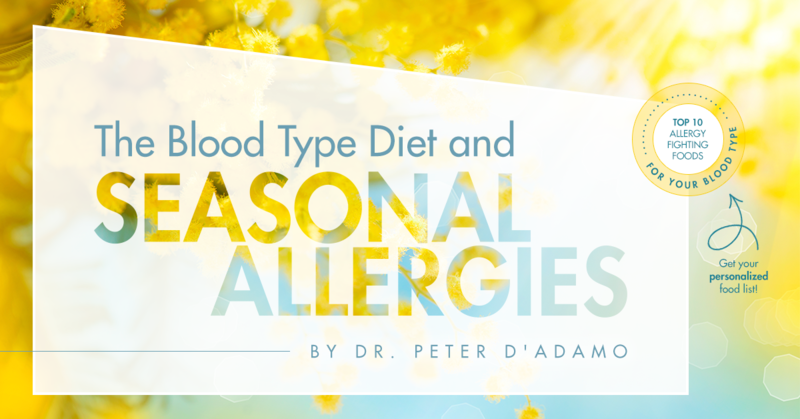 With all the vibrancy of new life comes the seasonal stress of allergies on your body. According to the Asthma and Allergy Foundation of America (AAFA), allergies impact around 30% of adults and 40% of children, with numbers rising year to year. Those affected spend about 18 billion dollars per year to fight these allergies, either through medicine, remedies or doctor and hospital visits. These numbers are staggering and show the true scope of the problem. Allergies can put stress on your body, causing it to work overtime to handle the perceived threat. Reducing the overall stress on your body by following the Blood Type Diet is a great first step. Your body needs to work hard to deal with food lectins that are not right for your type, which is one point of pressure. Warding off seasonal illness is another. Often the body can handle the effects of dietary lectins or environmental allergens individually, but trying to deal with both simultaneously can cause symptoms. A diet of harmful lectins also can lead to leaky gut and overall inflammation, two things that stress your body further and can cause even more unwanted reactions. These reactions can include but aren’t limited to: skin conditions, digestive problems, respiratory issues, eye irritation, sinusitis or ear infections. 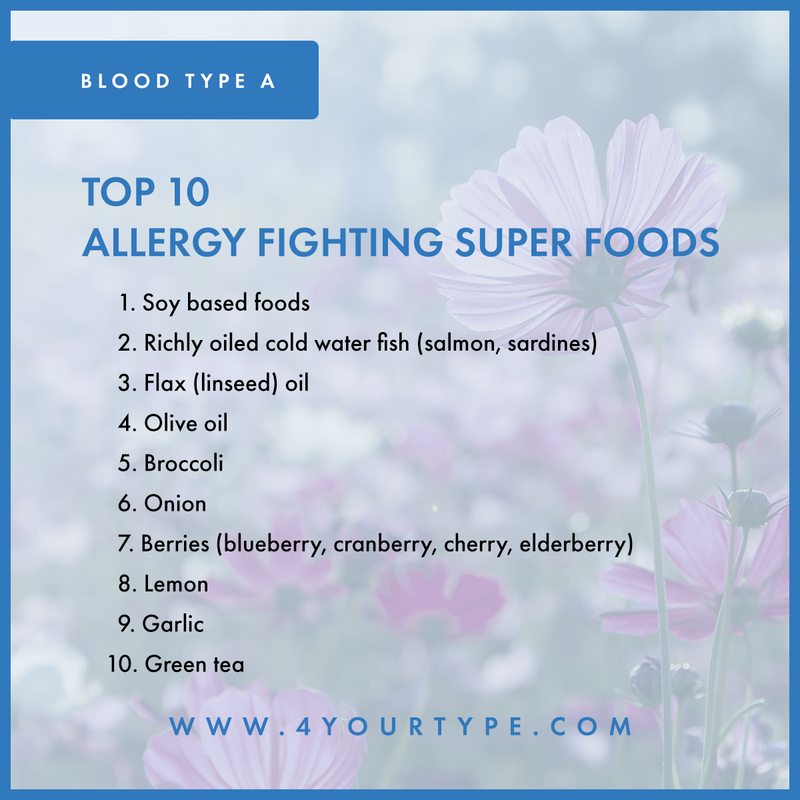 As with nearly every symptom your body can experience, allergies can have slightly different effects for people with different blood types due to the natural inclinations of the type in question. Here are some basic trends for each type in relation to allergies. Type O: dietary lectins react more with immune system (IgE) molecules, leading to more aggressive allergies and overall inflammation. Type A: produce more mucus on average and more of a substance known as selectin, which leads to inflammation. Type B: increased susceptibility to forms of lung inflammation, like asthma and viral infections. Type AB: lower overall immunity, but some of the best resistance to respiratory based allergies. If you are interested in learning more about the relationship between your body’s blood type specificity and allergies, I wrote a book on the subject called Allergies: Fight It with the Blood Type Diet. This book takes the wisdom of the Blood Type Diet as laid out in Eat Right 4 Your Type and tailors it to particularly deal with allergies. 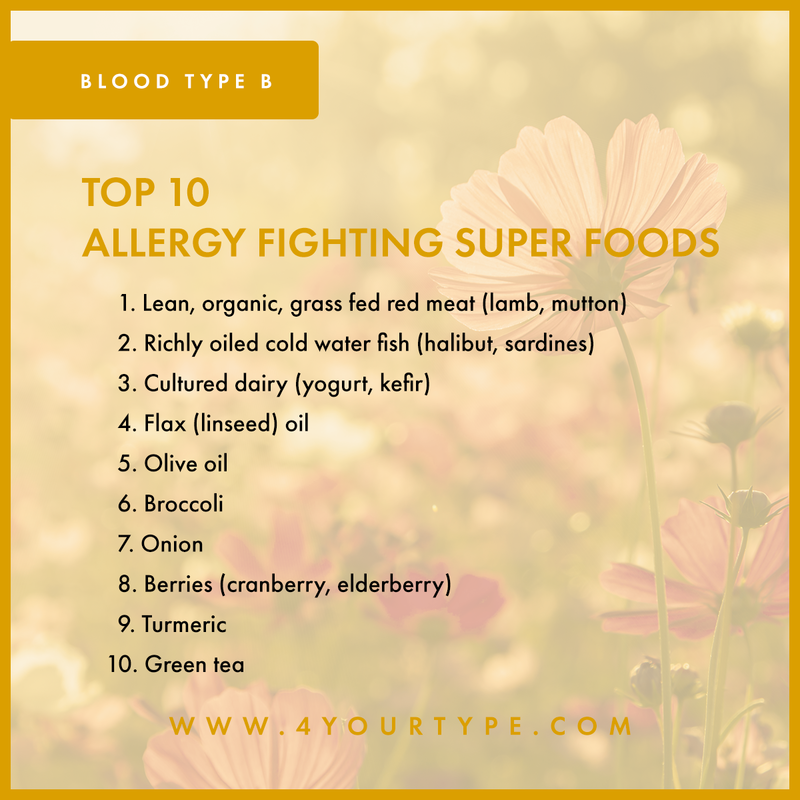 It has full food lists for each type, including a new “Super Beneficial” category that shows foods with specific benefits in relation to allergies. It also has a plethora of information on all the best practices to support your journey to better immune response. If you or someone you know is constantly sneezing and sniffly as soon as spring arrives, this book might hold the answers you have been searching for. 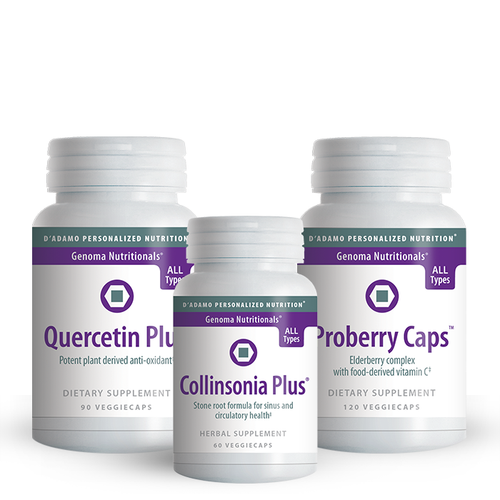 Quercetin Plus - Quercetin has been found to inhibit the release of histamine and stabilize cell membranes. Also includes Bromelain enzyme to increase absorption. Collinsonia Plus- Support for sinus and throat. Proberry Caps - Convenient capsules feature a critical 4:1 concentrate of elderberry combined with ARA6® to support healthy immune function. Most people who start any kind of diet do it for weight loss. For me, I found the Blood Type Diet appealing because my main goal was always overall health, not simply to lose weight. So, with that in mind, I started my Blood Type B diet 18 years ago and never looked back. The first thing I noticed about changing my diet was a pretty sizeable increase in my energy levels. I remember soon after I started, I visited Washington D.C. with some friends. Despite running around between all the touristy locales, I found myself never getting too tired while my friends couldn’t keep up. A few weeks in, not only had my energy levels continued to rise, but the seasonal allergies that usually plagued me this time of year were nowhere to be found. The pollen and natural elements that usually left me sniffly did nothing. My immune system in general felt bolstered, as I saw people around me falling ill to the flu and other illnesses while I remained healthy. Over the course of many years, I only fell victim to the flu and the common cold a handful of times. A friend of mine used to joke that my box of tissues would last so long all it did was collect dust. In summary, I feel very fortunate to have come across the ER4YT program. I became more conscious of what food I was eating and how that was affecting my life. Some local people still refer to me as the “Eat Right 4 Your Type” lady and after all these years, I'm glad they have incorporated it into their lives and they have noticed a difference as well. Updated to reflect the 20th Anniversary Edition of Eat Right 4 Your Type. 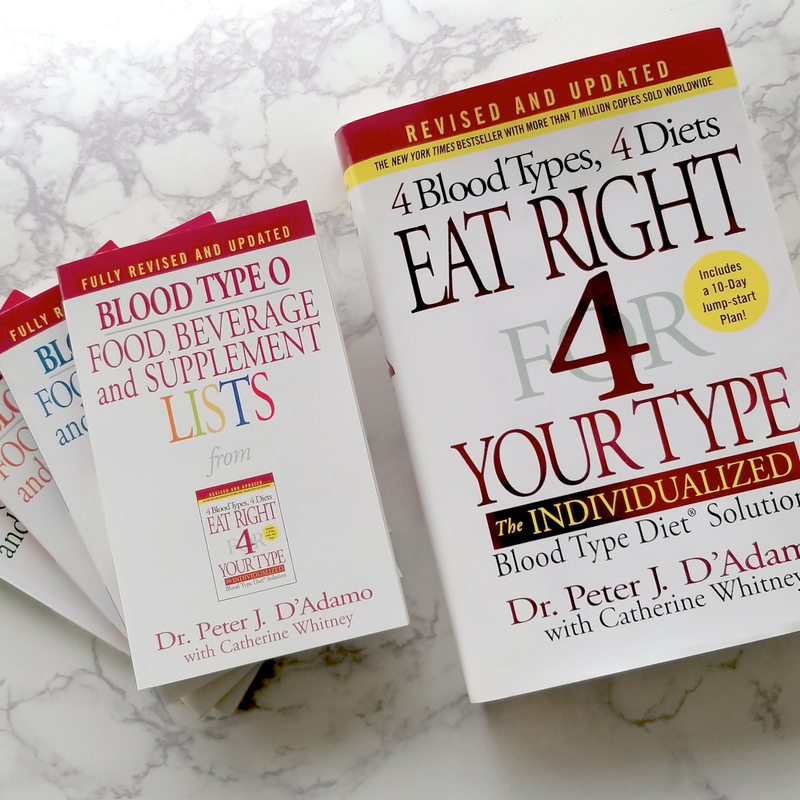 In 2017, Dr. Peter D'Adamo released the 20th Anniversary Edition of Eat Right 4 Your Type, his NY Times bestselling book that lays the foundation for following the Blood Type Diet. After years of research and refinement, he has updated the food values to reflect more modern developments and added foods that have become increasingly common in the past two decades. Now, you can carry this new information while on the go with our softcover Blood Type Diet Pocket Books: Blood Type Food, Beverage and Supplement Lists - one book for each blood type. Dr. Peter D’Adamo shared this article published by Men’s Health about the differing rates of heart attacks between men of different blood types. The Sun, a popular U.K. news website, talked about the wide-reaching effects blood type can have on your health, from infertility and strep throat to stomach ulcers and norovirus susceptibility. CureJoy recently reshared an article from Dr. Peter D’Adamo about heart health and the Blood Type Diet, the same topic we covered for American Heart Month in February. The Daily Telegraph AU discussed the benefits of planning your diet and exercise plans around Blood Type and included a great quote from one of our friends in the world of fitness, Mark Moon. "I see a big change in clients’ bodies when I put them on a plan that fits their blood type." 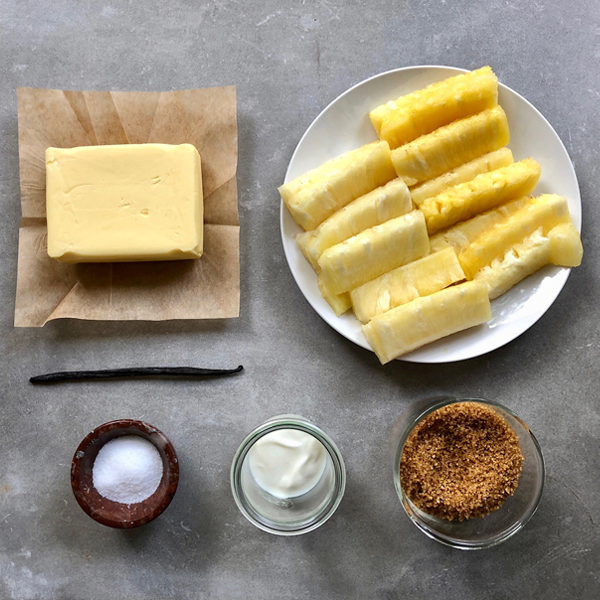 With spring fighting its way to the fore after a long and chilly winter, what better way to welcome the warmth than by making a treat with tropical flavor? 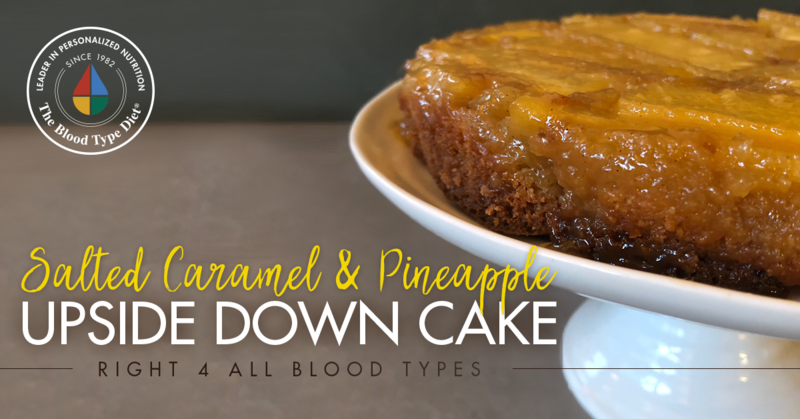 This pineapple upside-down cake includes pineapple, of course, which is a natural decongestant for spring allergies, but it's also a sweet cake enhanced with a homemade salted caramel. This symphony of vibrant flavors is sure to be the perfect segue from decadent winter treats to lighter spring snacks. *Sugar is an avoid for all non-secretors. Substitute with agave syrup. **Vanilla is an avoid for Type O non-secretors. Please omit. ***Yogurt is an avoid for Type O non-secretors. Substitute with rice or almond yogurt. Line a 9" round cake pan with parchment paper. To make the caramel, start by melting the ghee in a small saucepan over low heat with the sugar (or agave for non-secretors), salt and yogurt, stirring to combine for about 10 to 15 minutes. When the sugar has melted and the caramel forms, add the vanilla seeds and stir once. Transfer the caramel into the cake tin, making sure to coat the entire bottom of the pan. Arrange the pineapple strips in a single layer on top of the caramel, making sure they are well packed together. To make the batter of the cake, start by creaming the sugar with the olive oil / ghee on medium-high speed in the bowl of an electric mixer. 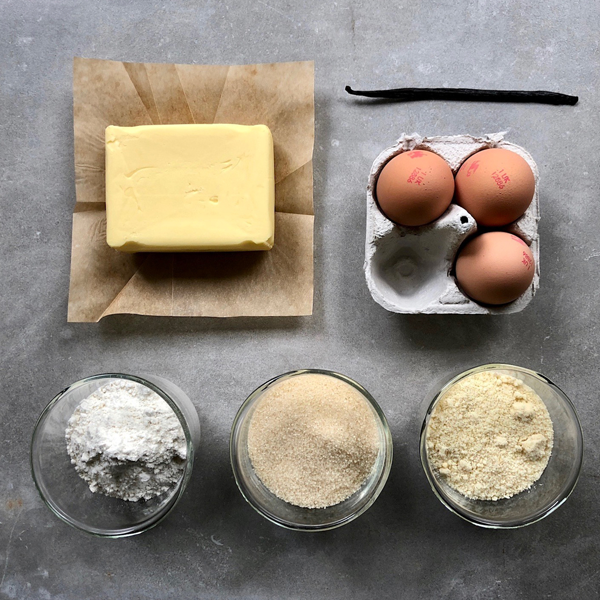 When the sugar has dissolved and the mixture is light and pale, add the eggs, vanilla seeds, followed by the flour, ground almonds and baking powder, until the batter becomes stiff and all ingredients are well combined. Spread the batter evenly in a thick layer over the pineapple, making sure to keep the strips in place. Place in the oven and bake for about an hour, or until a toothpick comes out clean. Allow the cake to rest a few minutes, then place a serving plate over the tin and carefully flip over. Remove the tin and serve warm.